*** Want to convert and burn your favorite video clips onto a DVD? 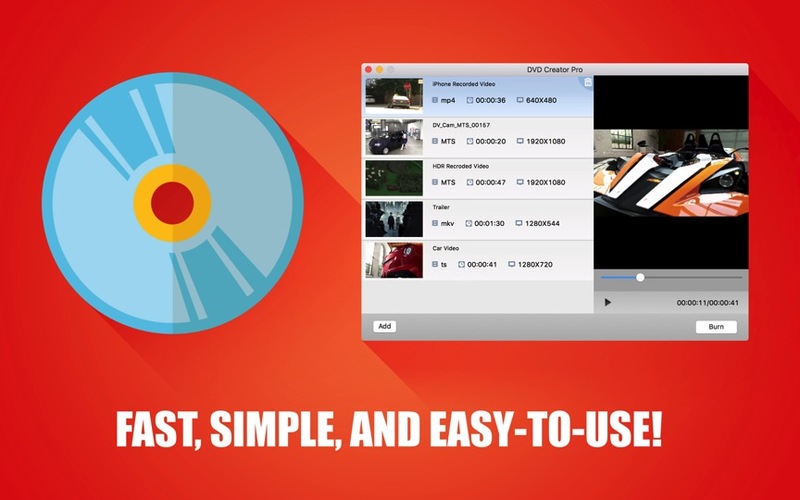 DVD Creator Pro is your solution. This handy tool can convert and burn all of the popular video formats (including videos shot by your mobile phone) to DVDs, so that you can play the DVDs on portable or home DVD players. 1. Click “Add” or drag your video files into the window. 2. Drag the videos up and down to change the order. You can click the “Trash” icon at the top right to delete videos. 3. Play videos on the right side window for preview. 4. Click the “Burn” button to start burning your DVD. • Supports all of the popular video formats, such as: MOV, MKV, MP4, AVI, WMV, MTS, and HD videos. • Creates DVD movies with the NTSC or PAL video standard. • Burns DVD movie discs directly, or creates a DVD folder/ISO image on your hard drive. • Easy and fast DVD creation — you can make a DVD with just a few clicks.